For a business dinner we dined at Italian Village Chicago and Wine Director Jared Gelband pulled from their extensive cellar this limited production Alpha Mare Napa Cabernet. 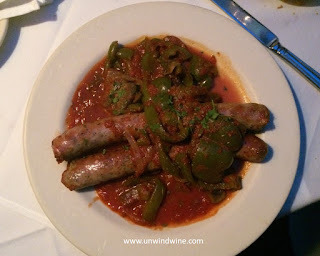 To accompany the wine, I selected a favorite dish, simple Italian Sausage and Peppers. According to the winemaker, this Classic Napa Cabernet "Alpha Mare is a Limited Production Red Blend Wine that represents the Best of the Best in our cellar". Dark garnet color, medium full body, complex, concentrated but nicely balanced and integrated bright expressive forward black berry and black raspberry fruits with highlights of mocha chocolate, notes of anise, hints of sweet oak, bright acidity punctuating its whopping Edit15.8% alcohol. 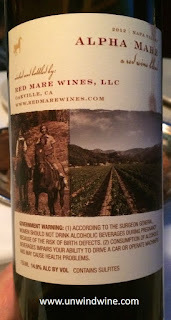 Producer Red Mare Wines sources fruit from very small, well-respected vineyards throughout the Napa Valley. The Cabernet Sauvignon fruit is sourced from the Prichard Hill area of Napa Valley where the mountain fruit is thick and dense, with tiny berries providing the firm backbone for Alpha Mare, giving it firm tannins, depth and minerality that reflects the unique terroir of the location. 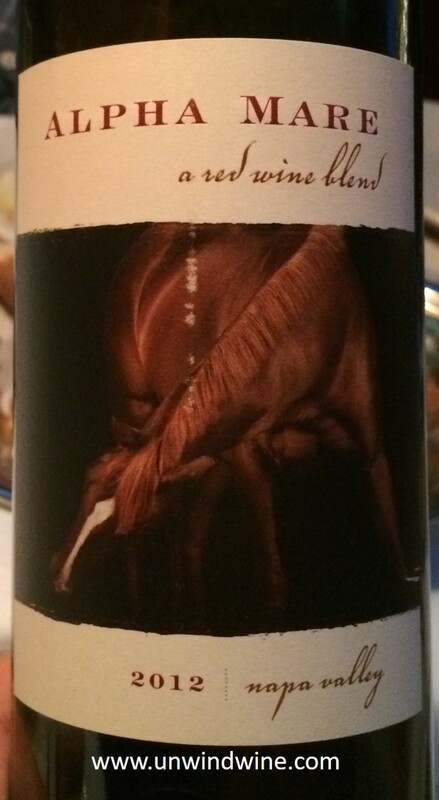 horse woman, Anne named her wine label in honor of her red mare, Paradigm, who was a bonus given to her during her time at Paradigm Winery. The inaugural release of Red Mare Cabernet Sauvignon was in 2007. Only slightly more than 100 cases are produced of this limited release premium label. As we did with our dinner at Italian Village two weeks ago when we sampled Argiolas wines from Sardinia, we reached back into IV's deep cellar for another label from this producer. 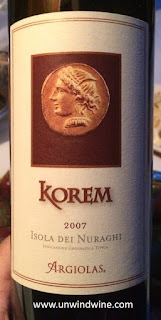 A more modest selection than the premium Argiolas Nurriga we tasted the other evening, this Korem was a perfect compliment to my Italian Sausage and Peppers entree. Colleague and dining guest Michael S selected this wine based on personal experiences with the producer and this label and his numerous visits to the region. Michael actually owns an authentic artifact of the ancient coin that adorns the label of this wine. This is a blend of Sardinian varietals Bovale Sardo, Carignan and Grenache. Resembles a Southern Rhone Gigondas or even a more complex CDP (Chateauneuf du Pape) which also features these varietals. Bright ruby colored, medium bodied, full forward tangy bright plum, cherry and berry fruits with notes of kirsch, spice and tones of cedar on the long moderate tannin finish.